Today we’ve seen plenty news regarding the Samsung Nexus and Ice Cream Sandwich. It appears a few are out in the wild and the leaks are finally starting to flood in so prepare for a few crazy days. Obviously there will be tons of changes and new apps, features in Google’s Ice Cream Sandwich but a few that are already leaking have just hit the wires. We have a new Google+ application, version 2.0, with a few changes, then a brand new Google Music app too. More details and download links below. First off it appears the new Google+ app comes pre-installed and is version 2.0. Recent updates changed Huddles to Messenger, and if this leak is accurate Google is changing it yet again to something called “Chord”. Personally I think messenger was fine and Chord will only confuse people, but what do I know right? We still may see another name come the official launch, but with it being version 2.0 this looks like a final build of some type. There are also numerous UI changes and you can see all of that and more at the source. Next up we have a brand new Google Music application, this excited me even more. 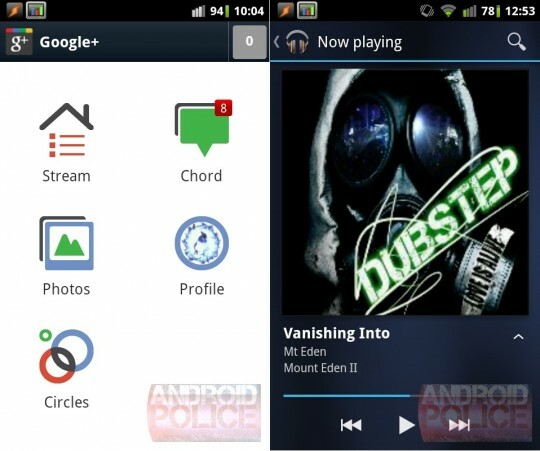 I love Google Music and now we are seeing a new and improved version 4.0.1 from the Ice Cream Sandwich leaks. Basically what we have is a revamped but similar user interface, a clean and simple look, much better controls, and an overall design looking very similar to ICS. It looks quite similar to version 3.0 but just overall cleaner and much more simple. The playing now tab on bottom seems smaller too, check out the picture. Everything looks nice. I wont get into the details too much because all of this is just starting to hit the wires. Sadly the Nexus Prime CTIA event was canceled in respect to Steve Jobs, so we’ll all have to wait a little longer to get a full look at Ice Cream Sandwich, although I’m sure plenty of leaks are coming shortly so stay tuned to Android Community.